Hi, I'm Shai Coggins. Welcome to my home on the web! If creativity, productivity, and learning how to recharge in life matter to you, then I hope that ShaiCoggins.com becomes your home on the web too. I'm an author, teacher, and entrepreneur, with a love for creativity, digital communications, and community. I have been maintaining ShaiCoggins.com since 1999. My life and my work have evolved a lot over the years, and so has this website. If you go back far enough into my archives, you'll see what I mean. But, instead of cleaning them out and deleting my earlier attempts, I choose to keep them up for now as a reminder that life isn't always as tidy as we hope it to be. And that success is not linear nor is it something that happens without bumps and a few wrong turns. This most recent iteration of ShaiCoggins.com is all about nurturing a place on the web where readers and visitors can find exclusive resources, e-courses, and more - for people who wish to find joy and success through creativity, entrepreneurship, and good living. I love helping individuals and organisations identify and achieve goals, increase productivity, and explore creative practice. My Strengths Finder themes are: Maximiser, Strategic, Intellection, Achiever, and Ideation. On Myers-Briggs: I'm an INFJ. And yes, I love personality and psychological tests. They're the reason I studied psychology for over six years and practiced in the field of psychology for over a decade, before semi-retiring in this type of work in 2010. Right now, I own and manage Vervely, a boutique digital media company, offering social media, content and community management. On the side, I run a small independent publishing company and an art and design business. I am based in Adelaide, Australia, with my husband and two children. Before calling Australia home in 2003, my husband and I lived and worked in Singapore for a few years. Before that, I was born and raised in the Philippines. I also spent almost a year travelling in the USA before getting married. My other loves include tea, chocolates, travel, reading, flowers, art supplies, gadgets, and stationery. I love TV and movies, with a special attachment to Game of Thrones (books + TV), Star Wars, and Harry Potter (books + movies + everything else). And yes, I am also known to enjoy a bit of drama and romantic comedy. I have published a colouring book, a guided journal, and a children's book. You can read my more formal bio below. Or, you can simply sign-up to gain access to our exclusive resources in the content library. About Shai, The Formal Version. 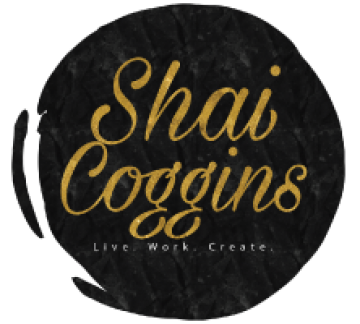 Shai Coggins is an Adelaide-based author, serial entrepreneur, and teacher, with a love for creativity, digital communications, and community. She is the owner and digital lead of Vervely, a boutique digital media agency established in 2012. And, on the side, she runs a small independent publishing company and an art and design business. Shai has been featured in Fast Company's list of "Most Influential Women in Technology (Blogging)", along with the likes of Arianna Huffington, Beth Kanter, and others. Shai's work has also been featured in various media like The Advertiser (Adelaide), Elle Magazine (Singapore), Reader's Digest (Australia), SBS Radio (Australia), Manila Bulletin (Philippines), CNET Asia, The Straits Times (Singapore), ABS-CBN TV (Philippines/Australia), The Myanmar Business, and more. Shai has also been a speaker, trainer, and keynote presenter in various conferences, workshops, and other events worldwide, including, but not limited to: Microsoft Connecting Communities/Tech4Good (Australia, Malaysia, Philippines and Sri Lanka), NTC (Washington DC and San Francisco, USA), TechSoup Global (USA), and more. Some of the companies and organisations Shai has worked with include (past and present): Microsoft, PCS, Connecting Up, Sue Ismiel and Company, The Shannon Company, About.com, and others. She was named as a co-founder of a multimillion dollar, VC-funded digital media company, where she worked as VP of community from 2006 to 2009. Whilst Shai is best known for her work in digital, social media and blogging, she has also been developing her skills and expertise in art, design, publishing, and education. Primarily a self-taught artist, Shai has also studied with various art educators in Australia, Singapore, the Philippines, Malaysia, and the USA, including doing brief courses at Adelaide Central School of Art (Australia) and LaSalle College of the Arts (Singapore). Her art has been sold, collected, and exhibited in various countries. She has also taught beginners' art classes and mobile photography for artists workshop. Shai has published Today: Life (a guided journal) and Colour Bliss: Kaleidoscopes (a colouring book/journal) through Paper Boat Publishing and Goodbye Grandma (children's book, out of print) through Syndikos Publishing. Shai has a Masters degree in Teaching (Flinders University, Australia), a Master of Social Science degree in Applied Psychology (National University of Singapore) and a Bachelor of Science degree in Psychology degree (UST, Philippines). Subscribe to our mailing list for tips, discounts, and more. Success! Thanks for subscribing. Just need one more step - Please check your email to confirm your subscription.